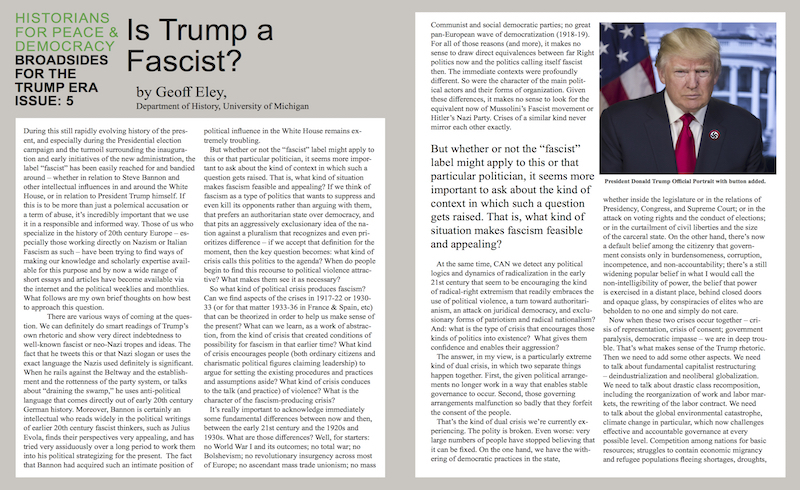 Click here to download Broadside #5: Is Trump A Fascist?, by Geoff Eley, author of Nazism as Fascism: Violence, Ideology, and the Ground of Consent in Germany, 1930-1945 and Forging Democracy: The History of the Left in Europe, 1850-2000. During this still rapidly evolving history of the present, and especially during the Presidential election campaign and the turmoil surrounding the inauguration and early initiatives of the new administration, the label “fascist” has been easily reached for and bandied around — whether in relation to Steve Bannon and other intellectual influences in and around the White House, or in relation to President Trump himself. If this is to be more than just a polemical accusation or a term of abuse, it’s incredibly important that we use it in a responsible and informed way. Those of us who specialize in the history of 20th century Europe — especially those working directly on Nazism or Italian Fascism as such — have been trying to find ways of making our knowledge and scholarly expertise available for this purpose and by now a wide range of short essays and articles have become available via the internet and the political weeklies and monthlies. 1 What follows are my own brief thoughts on how best to approach this question. There are various ways of coming at the question. We can definitely do smart readings of Trump’s own rhetoric and show very direct indebtedness to well-known fascist or neo-Nazi tropes and ideas. The fact that he tweets this or that Nazi slogan or uses the exact language the Nazis used definitely is significant. When he rails against the Beltway and the establishment and the rottenness of the party system, or talks about “draining the swamp,” he uses anti-political language that comes directly out of early 20th century German history. Moreover, Bannon is certainly an intellectual who reads widely in the political writings of earlier 20th century fascist thinkers, such as Julius Evola, finds their perspectives very appealing, and has tried very assiduously over a long period to work them into his political strategizing for the present. 2 The fact that Bannon had acquired such an intimate position of political influence in the White House remains extremely troubling. But whether or not the “fascist” label might apply to this or that particular politician, it seems more important to ask about the kind of context in which such a question gets raised. That is, what kind of situation makes fascism feasible and appealing? If we think of fascism as a type of politics that wants to suppress and even kill its opponents rather than arguing with them, that prefers an authoritarian state over democracy, and that pits an aggressively exclusionary idea of the nation against a pluralism that recognizes and even prioritizes difference — if we accept that definition for the moment, then the key question becomes: what kind of crisis calls this politics to the agenda? When do people begin to find this recourse to political violence attractive? What makes them see it as necessary? So what kind of political crisis produces fascism? Can we find aspects of the crises in 1917–22 or 1930–33 (or for that matter 1933–36 in France and Spain, etc) that can be theorized in order to help us make sense of the present? What can we learn, as a work of abstraction, from the kind of crisis that created conditions of possibility for fascism in that earlier time? What kind of crisis encourages people (both ordinary citizens and charismatic political figures claiming leadership) to argue for setting the existing procedures and practices and assumptions aside? What kind of crisis conduces to the talk (and practice) of violence? What is the character of the fascism-producing crisis? It’s really important to acknowledge immediately some fundamental differences between now and then, between the early 21st century and the 1920s and 1930s. What are those differences? Well, for starters: no World War I and its outcomes; no total war; no Bolshevism; no revolutionary insurgency across most of Europe; no ascendant mass trade unionism; no mass Communist and social democratic parties; no great pan-European wave of democratization (1918-19). For all of those reasons (and more), it makes no sense to draw direct equivalences between far Right politics now and the politics calling itself fascist then. The immediate contexts were profoundly different. So were the character of the main political actors and their forms of organization. Given these differences, it makes no sense to look for the equivalent now of Mussolini’s Fascist movement or Hitler’s Nazi Party. Crises of a similar kind never mirror each other exactly. At the same time, can we detect any political logics and dynamics of radicalization in the early 21st century that seem to be encouraging the kind of radical-right extremism that readily embraces the use of political violence, a turn toward authoritarianism, an attack on juridical democracy, and exclusionary forms of patriotism and radical nationalism? And: what is the type of crisis that encourages those kinds of politics into existence? What gives them confidence and enables their aggression? The answer, in my view, is a particularly extreme kind of dual crisis, in which two separate things happen together. First, the given political arrangements no longer work in a way that enables stable governance to occur. Second, those governing arrangements malfunction so badly that they forfeit the consent of the people. That’s the kind of dual crisis we’re currently experiencing. The polity is broken. Even worse: very large numbers of people have stopped believing that it can be fixed. On the one hand, we have the withering of democratic practices in the state, whether inside the legislature or in the relations of Presidency, Congress, and Supreme Court; or in the attack on voting rights and the conduct of elections; or in the curtailment of civil liberties and the size of the carceral state. On the other hand, there’s now a default belief among the citizenry that government consists only in burdensomeness, corruption, incompetence, and non-accountability; there’s a still widening popular belief in what I would call the non-intelligibility of power, the belief that power is exercised in a distant place, behind closed doors and opaque glass, by conspiracies of elites who are beholden to no one and simply do not care. Now when these two crises occur together — crisis of representation, crisis of consent; government paralysis, democratic impasse — we are in deep trouble. That’s what makes sense of the Trump rhetoric. Then we need to add some other aspects. We need to talk about fundamental capitalist restructuring — deindustrialization and neoliberal globalization. We need to talk about drastic class recomposition, including the reorganization of work and labor markets, the rewriting of the labor contract. We need to talk about the global environmental catastrophe, climate change in particular, which now challenges effective and accountable governance at every possible level. Competition among nations for basic resources; struggles to contain economic migrancy and refugee populations fleeing shortages, droughts, and floods; rivalries over resources for energy — these will all reshape the language of national security ever more divisively. My own view is that the creation of a borderless world (in the now-understood neoliberal sense), the collapse of state sovereignties in a huge expanse of territory from West Africa through the Middle East to Afghanistan and Pakistan, and the unstoppable continuance of the crisis of global migrancy (these are obviously short-hands) are all generating the materials for virulent popular anxieties about boundaries and borders inside the societies of the advanced capitalist countries. And those conditions unleash dynamics that can only become more and more destabilizing as rivalries over resources grow more and more unpredictable and extreme (hence the powerful impact exercised by climate change). In the end, it’s these anxieties about borders and boundaries and about “difference” that drive a great deal of the right-wing nationalist vehemence that we’ve been witnessing in the Trump campaign and the analogous politics in Europe. Fortress mentalities, idioms of politics organized by anxiety, gatedness as the emergent social paradigm — these increasingly drive the authoritarian and violent tendencies of contemporary governmentality. If we put all of this together, then we have the kind of crisis that can enable a politics that looks like fascism to coalesce. And this is where Trump has prospered. This is the value of informed and careful historical comparison. We can look at earlier situations — in this case the kinds of crises that produced fascist politics in the past — in order to measure them against the severity and form of the crisis we’re facing in the present. If the core dynamics associated with the rise of fascist states in the past really do seem to be arising now, then what can we do to stop them? As the new administration continues to roll out new Executive Orders and legislation, and Trump’s unique personal style continues both captivating and frightening people, it will be vital to continue asking these questions. 1. Two posts by Jane Caplan: “Unsettling Echoes: Joseph Goebbels (1933), Sean Spicer (2017), Steve Bannon (2017),” Jan. 30, 2016; and “Trump and Fascism. A View from the Past,” Nov. 17, 2016, at http://www.historyworkshop.org.uk/author/jane/; An interview with Richard Evans: Isaac Chotiner, “Too Close for Comfort,” http://www.slate.com/ articles/news_and_politics/interrogation/2017/02/ historian_richard_evans_says_trump_s_america_isn_t_exactly_like_the_third.html; Interview with Isabel Hull: Raphael Pope-Sussman, “A German Historian’s Thoughts on Trump Bannon, Fascism & America,” http://gothamist.com/2017/02/06/trump_bannon_german_history.php. 2. Jason Horowittz, “Steve Bannon Cited Italian Thinker Who Inspired Fascists,” New York Times, Feb. 10, 2017, https://www.nytimes.com/2017/02/10/world/ europe/bannon-vatican-julius-evola-fascism.html.